The real-life girl was promoting the idea of giving the comic girl a flamethrower in panel 4, but I feel that negates the message of the comic. People who meet me as an adult don’t necessarily believe that I am a true introvert, and many of them are surprised to learned that I was, for many years, a friendless outcast silently suffering an endless campaign of bullying. I was one of those super-hated kids who got it from both sides, the boys and the girls, in public school and Hebrew school, physical and emotional, and furthermore, there were a couple teachers who I felt were pretty mean for no good reason. Sure, I was probably an insufferable know-it-all who talked about weird and esoteric topics and didn’t realize that others judged me on my external appearance, but what I really would have liked was to be left alone. Like many super-nerds, I made it to college (I graduated high school early and started college literally 2 weeks later; that’s how desperate I was to get out, even though the bullying subsided by sophomore year), worked out some social skills, and suddenly found that the haters were in the minority and I was a relatively well-liked dragon. Still and all, when the girl started complaining that she was being bullied in school, I suffered a couple weeks of PTSD with her. When I was a kid, there was no response to bullying from school administrations. I doubt they could have done much; when 50% of the 7th grade is involved in perpetrating terror, it’s not like they’re all just going to stop because you tell them. Once, a boy punched me in the nose on the school bus and my mother called his mother, which had no effect on his behavior, and there was nothing else to do. That’s not the case now. Most schools brag about their zero-tolerance policy for bullying, and while anyone who knows anything about children can roll their eyes with the knowledge that adults can’t keep a promise like that, at least they actually try. Ben’s Bells is a beloved Tucson institution, working toward the goal of strengthening communities through kindness awareness. They have a lot of programs, and offer effective kindness education to schools in the region. Most school participate, include the girl’s. When the bullying began, her parents and I tried to offer her some tools for standing up for herself and getting away from her tormentor, but she wasn’t able to wield them effectively, so I contacted her teacher, who immediately brought several administrators on board, sent the girls to the school’s dedicated kindness counselor (can you imagine? how different would life have been 30 years ago? ), and immediately ended the problem. Just like that. So, I didn’t give the girl a flamethrower, because you don’t have to fight fire with fire. It’s actually more effective to overwhelm it with water: compassion. 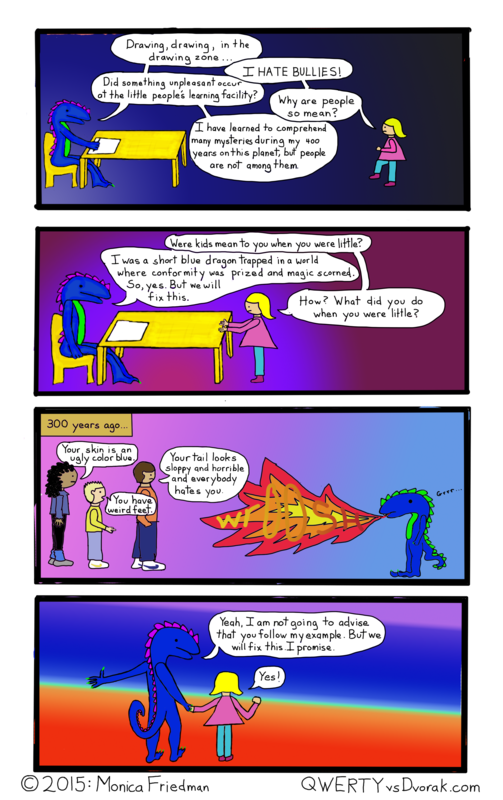 This entry was posted in Comics, Dragons and tagged ben's bells, bullies, bully, bullying, dragon, girl, haters, kind, kindness, mean, teasing on January 19, 2015 by littledragonblue.